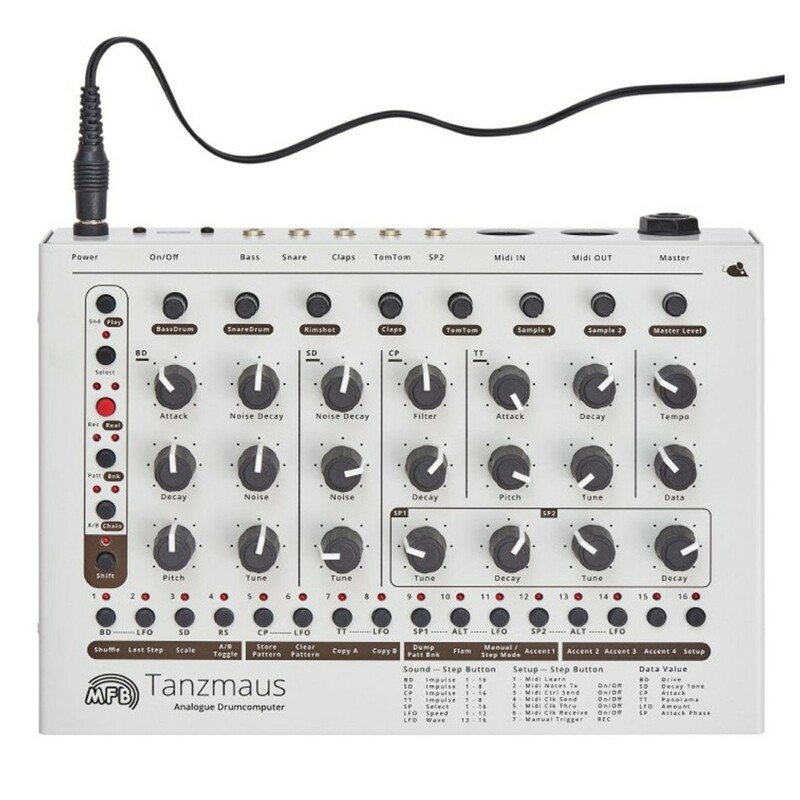 The MFB Tanzmaus is a five-voice analog drum machines including 2 sample based voices with sixteen 12-bit samples. The MFB Tanzmaus Analogue Drum Machine features an integrated 64 step sequencer with pattern chain and AB variation, allowing you to create rhythms and patterns on the fly. The Tanzmaus builds on the success of its predecessor (MFB 503) with a wide array of high-quality sounds including: Bass drum, snare, rimshot, claps, tom and two sample instruments. Each instrument features its own controls (apart from rimshot) allowing you to sculpt the sound to your own desire. Its compact and highly portable design makes it ideal for stage and studio. 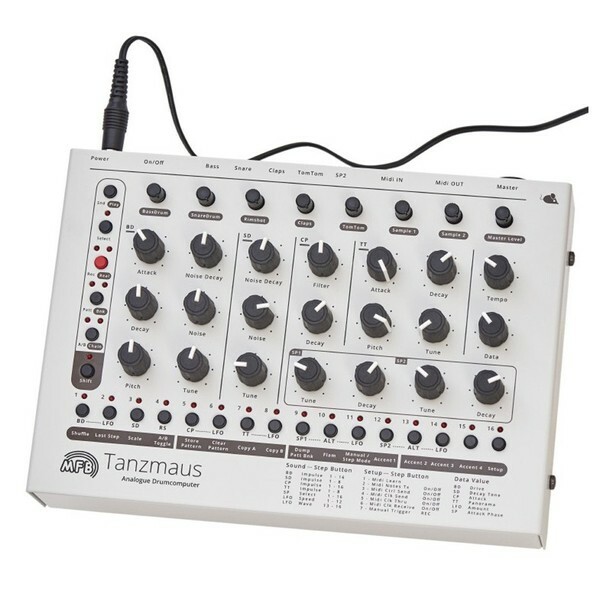 The MFB Tanzmaus Analogue Drum Machine is a compact and robust drum computer machine boasting 5-voices and 2 sample tracks. The versatile design of the Tanzmaus provides you with a high-quality selection of drum samples including a full drum-kit and additional sample tracks. Building on the success of its predecessor – the MFB 503; the Tanzmaus includes a range of improvements and enhancements. The five analog percussion instruments span an entire drum kit giving you everything you need to create rhythms and sequences with ease. The 64 step sequencer gives you the ability to create complex patterns on the fly. The sequencer allows you to store up to 64 patterns in total, as well as chain up to 16 different patterns with the A/B switch for optimal versatility. You can also use up to 16 different Flam algorithms for changing the characteristics and tone of your patterns. You can also change the ‘Shuffle’ control to add flare to your patterns, switching the way they play for added character. Additionally, each sound parameter can be recorded in step or realtime mode. Four accents are available for each instrument as well as Five LFOs. These in-depth modulation controls allow you to change the pitch and tone of each instrument to your desire. 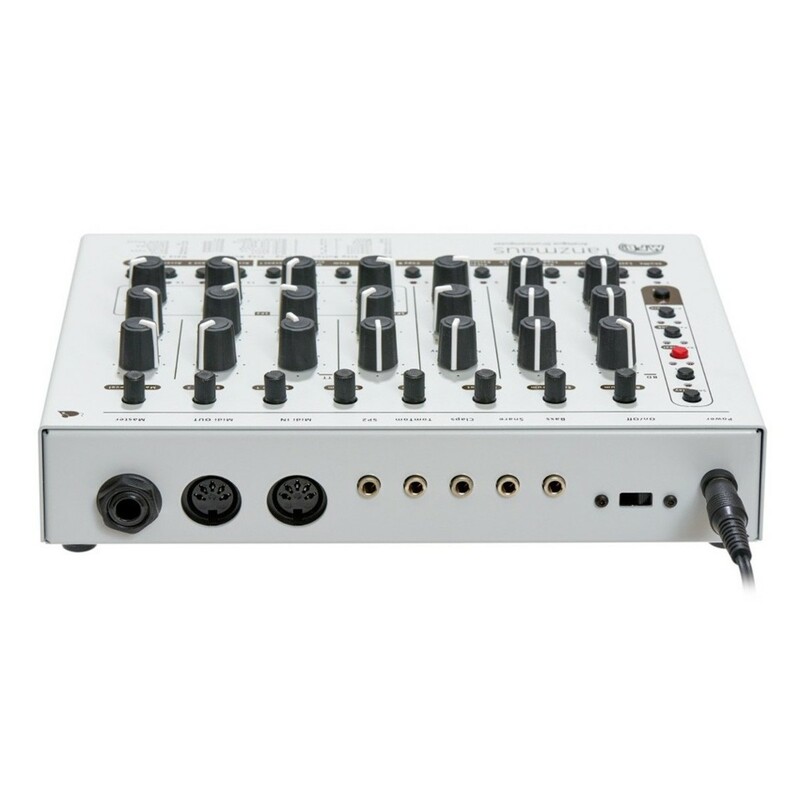 The LFOs are comprised of four different waveforms, allowing you to program them independently for each sequencer step. The two additional channels allow you to use external samples, either from your collection or ones you have crafted yourself. The compact and robust design makes the MFB Tanzmaus ideal for both live and studio applications. The highly durable metal chassis ensures the Tanzmaus can withstand the rigors of extensive and prolonged use. Each of the instruments feature their own controls including master volume controls. The Tanzmaus also includes five individual outs, as well as a stereo main output. MIDI In, Out/Thru, CC and Dump connections are also included for using the drum machine with other equipment such as computers. For more information on the MFB Tanzmaus please refer to the PDF above.